It’s Thai week here at Measure & Stir, a week of Thai-inspired drinks made using the limited pallet of beer, wine, and soju; lower-proof spirits that don’t require a liquor license to pour – perfect drinks for any Thai restaurant to serve! Today I present a drink that Joe and I both agree was one of the best drinks we came up with this week. When we thought “Thai”, we thought “tom kha“, and stealing an idea from Steve Livigni, of Drink inc, we set out to make a drink inspired by the soup. 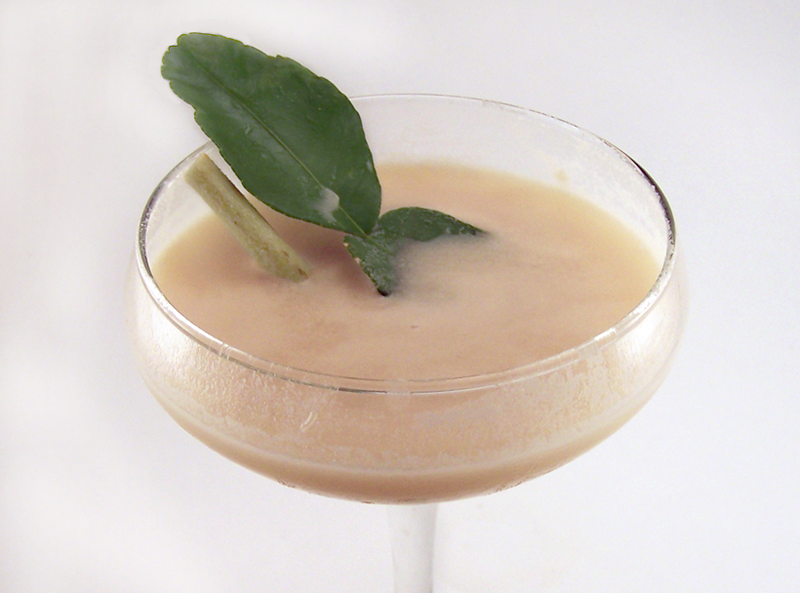 We imagined lemongrass, galangal, and kaffir lime leaves infused in soju. We made this drink last Saturday, during our first Thai drinks mixing session. I think it was probably the best drink we made that day. The idea just came together so well. The aroma of galangal, the bright zest from the lemongrass, and the citrus notes from the kaffir leaves are represented brilliantly in soju infusion. Add some coconut juice and it’s flavor Thaime. 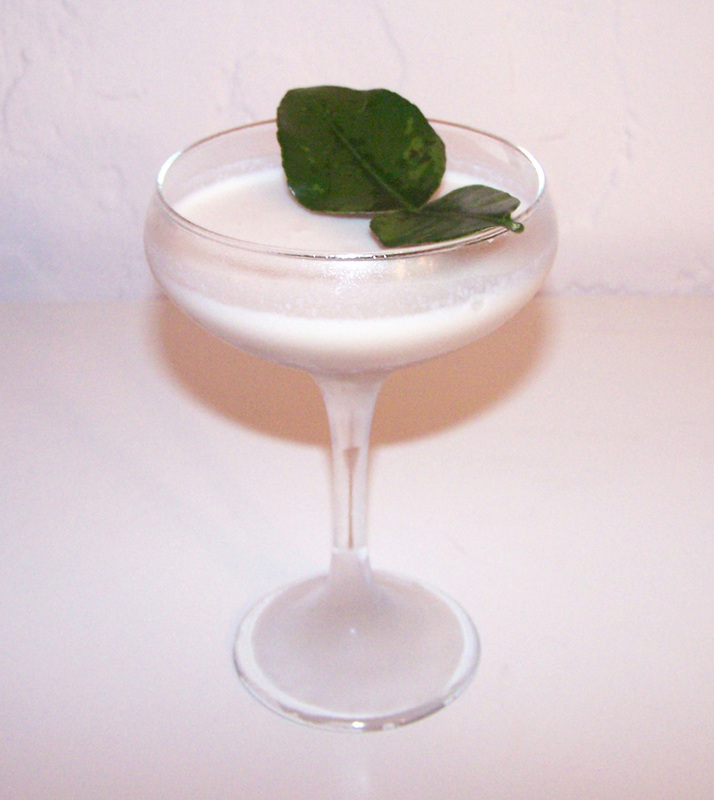 Shake over ice and double-strain into a cocktail glass. Garnish with a kaffir lime leaf. Shake over ice and double-strain into a cocktail glass. Garnish with a kaffir lime leaf and a sprig of lemongrass. Now, you may be thinking “fish sauce?”. And as you mix this drink, you may think to yourself “this stuff smells awful, how can this possibly taste good in a drink?”. Trust us. It does. This is why we decided to make this drink again. The fish sauce amps up all of the flavors, and lends a certain umami to the drink, especially accentuating the richness of the coconut flavor. The flavors in the first version are too mild, and don’t really shine. The improvements we made for the second iteration are keepers, and vastly improved this drink. You should make this version of the drink if you choose to mix one for yourself. Dry shaking this drink didn’t seem to affect how the coconut juice frothed in the end. Also, as we discovered the night we made the Singha Highballs, adding a teaspoon of bird’s-eye chili-infused soju doesn’t affect the flavor of a drink in a significant way, but does add just enough heat to simulate the sensation of drinking a stiffer spirit, something that’s usually missing in a cocktail with a base spirit like soju. Usually this would be the last post this week, but since Joe and I went a little crazy with Thai week, we’ve decided to keep on posting all the way through the weekend. Stay tuned for another drink tomorrow, followed by our final Thai drink menu and summary on Sunday. Categories: infusions, modern drinks, original creations | Tags: alcohol, bartending, bird's eye chili, booze, cocktail, cocktails, coconut, coconut juice, drinking, drinks, fish sauce, galangal, kaffir, kaffir lime, lemongrass, lime, lime leaf, mixed drinks, mixology, nam pla, simple syrup, soju, thai, thai chili, tom kha | Permalink.